What really magic is? It is often said and believed to be the ability of hands. Magic is the sleight of hands that is done to amaze people. For years magic and magicians have been entertaining people. Where pessimists refuse to believe in it and say that these are just tricks that fool people around, the grown-ups also aren’t any different. But, the fact doesn’t end here. Magicians have been able to make children happy for ages. The innocent eyes of a child shining with happiness when he sees anything magical feels awesome. Movie Industries have been trying a lot to give us films on magic. While some have made movies on magic, some have used illusion as the story. 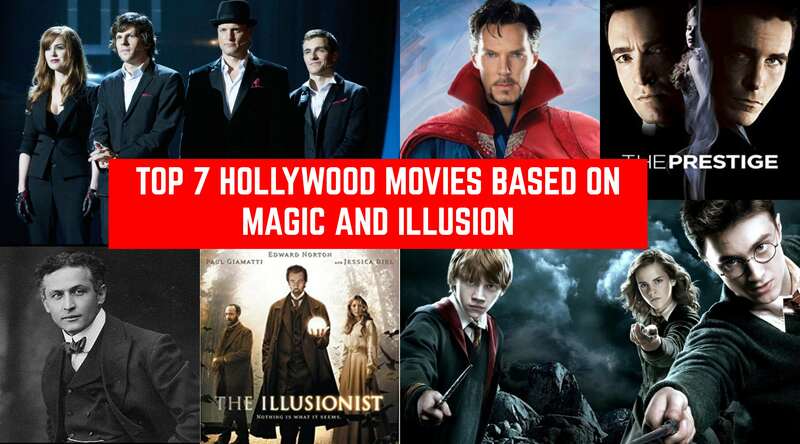 Here I list TOP 7 HOLLYWOOD MOVIES MADE ON MAGIC AND ILLUSION. The plot shows the game between two magicians having great hatred for each other trying to dominate each other to show who is best going to a lifelong feud which leads to something bigger and leads the viewers to absolute amazement. Directed by the visionary Christopher Nolan, it is a story of the hurt ego of men leading to unknown secrets. The film stars Christian Bale and Hugh Jackman along with Sir Michael Caine and Scarlett Johansson. It’s an entertaining story, using politics and magic as the underlying themes. Eisenheim The Illusionist, is a mysterious character with an agenda buried deep down in his heart. He dares to oppose the tyrant crown prince, using the only weapon in his armory – Magic. Ed Norton poured his heart out while playing this role and you could feel the same when you see a broken man seeing his dead beloved. Wait, did I say she was dead? Well, before I spoil the surprise, go and watch it, if you haven’t. This animated film, directed by Hayao Miyazaki and produced by Disney received widespread acclaim around the world and also won many awards, including the Academy Award for the best-animated feature film. The story shows a family of three taking a wrong way to enter an enchanted spirit world. The father and mother turn into pigs and the daughter is left to tend herself in a world ruled by a witch. It is an animated movie filled with magic and woven by love. Is there anyone on planet Earth who doesn’t know who Harry Potter is? I don’t think so. Probably the best magical movie series of SK time based on the sander books by J.K. Rowling. The story is about a child whose parents were killed when he was small, and he goes to Hogwarts, the school of magic and fights away all his enemies is just mesmerizing and breath-taking. The films have been great hits all over the world and in my list, are the toppers. The film star Daniel Radcliffe, Emma Watson and Rupert Grint as leads. A summer hit even without a good storyline, this film is about four magicians, who call themselves The Four Horsemen, loot a bank in Paris while performing in a live event at Las Vegas. But the FBI, led by Mark “The Hulk” Ruffalo get to know about it and start chasing them. Joining them is a former magician working as a magician-exposer. The rest of the story is about the cat and mice chase, but here the mice escape! This one isn’t about magic only, but the illusion he is perfect. Yes, an old one indeed. Named after the famous escapologist of all time, the term or expression used in order to explain a vanishing act from an inescapable situation is known as a ‘Houdini’ act. It has been named such because Harry Houdini was famous for his escapes from any confinement that he was put in. Based on his life, a highly fictionalized movie came out in 1953 which primarily aimed at his exploits. Starring Tony Curtis as the protagonist, ‘Houdini’ is a showreel of the man’s spectacular acts and only touches the surface of his troubled relationship. It’s old, but you’ll surely like the film. Go watch it. Pingback: Halloween Slashes Box-Office With A Record Weekend Opening! Pingback: WATCH: Captain Marvel Trailer 2 is Here and it’s Mindboggling!